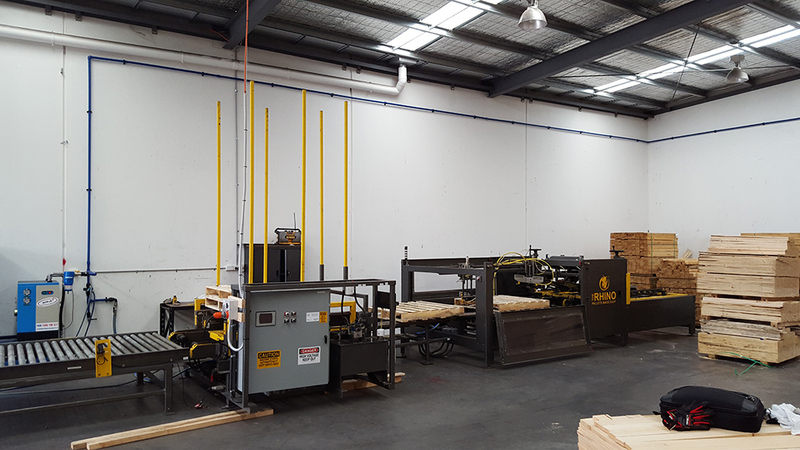 The Rhino Pallet Nailing Machine™ is a robust and highly diverse pallet nailing system capable of building 600 pallets per day. Depending on the model type the Rhino will accommodate pallet sizes ranging from 36″ x 36″ to 60″ x 60″. The simplistic open deck design allows for easy loading of raw materials into the jig. 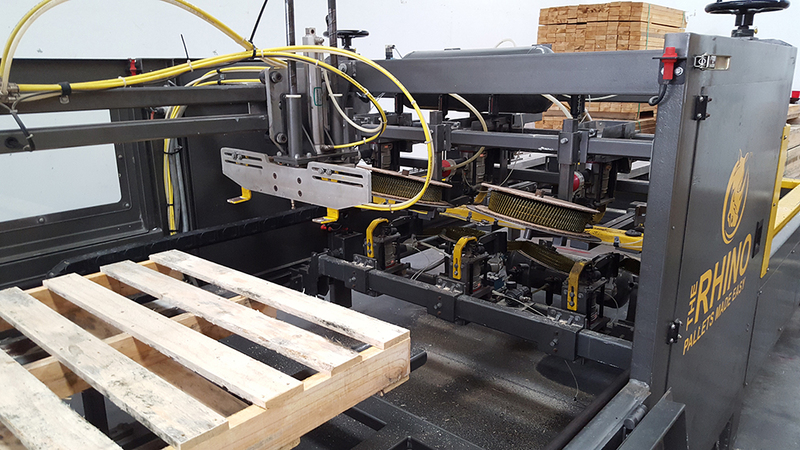 The flexibility of the pallet clamping system allows for easy change over accommodating pallet configurations from 3 to 4 stringer pallets design. 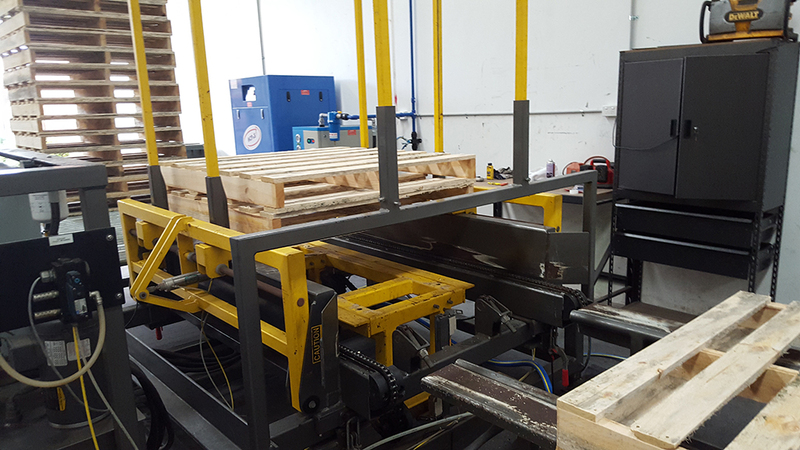 The pallet clamping system squarely secures the boards and precisely positions them for the nailing process. To eliminate builder fatigue the Rhino Pallet Nailing Machine™ operates with push button controls allowing the pallet assembly to travel through the pneumatic nailing tools that fastens both the top & bottom deck boards’ simultaneously eliminating the need to turn over the pallet. 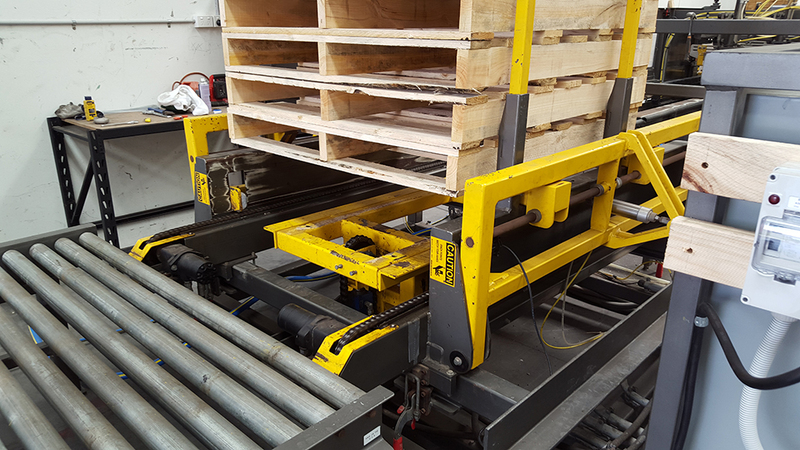 The Rhino Pallet Nailing Machine™ as an option may come with and adjustable pallet stacker and optional gravity or powered out-feed conveyor allowing the pallet to be stacked to the required height making it the most valuable machine for any pallet production. The Rhino Pallet Nailing Machine™ is highly effective in doubling the production rate compared to manual pallet nailing. The Rhino Pallet Nailing Machine™ can hold 3000 nails per coil per nailing gun which means that approximately 150-200 pallets can be produced before any reloading is required. Please note that the customer needs to supply a proper air compressor needed to operate the pallet nailing machine. The air compressor is not included in the purchase price but can be added on as an additional option. A recommendation is provided which meets the pallet nailing machine requirements. 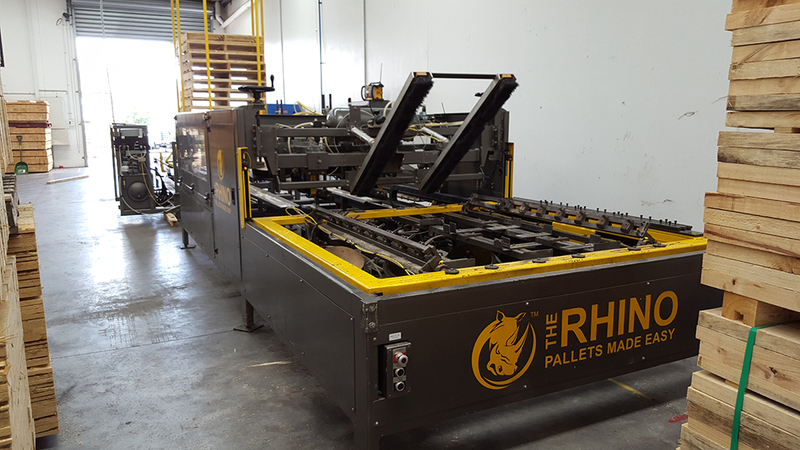 BC Market Solutions™ has complementary videos of The Rhino Pallet Nailing Machine™ in full pallet production. Feel free to view our video library for any additional information regarding system set up and controls. When installing the Rhino Pallet Nailing Machine™ it is require that the customer have an area free and clear of any debris and enough space to operate the pallet making machine freely. The customer is responsible to bring in a dedicated air supply to the machine which has enough air volume to operate it without any interruptions. Further the customer will be responsible for hire a licensed electrician to terminate the power supply into the main panel. Below is a list of equipment & requirements needed to operation the machine. 480 volt, 3 phase or per customer requirements. 6 to 8 pneumatic nailing tools with remote valves. Dedicated 20 HP Compressor with 250 gallon holding tank. 2″ x .099 High Load Collated Nail, 3000 per coil. The Rhino Pallet Nailing Machine™ is a complete nailing system equipped with pallet making machine, quality inspection zone, pallet stacker and gravity out-feed conveyor. Below are just a few highlighted features that represents the overall quality of the to the pallet nailing machine. Upper & Lower head assembly with mounted nail gun supports. The Rhino Pallet Nailing Machine™ Safety Switches and Sensors are designed and built to global standards for high reliability, stability, and quality. Our safety sensors are integrated throughout the machine which gives us a full closed loop system to protect personnel working on or around the machine. If any reason that E-Stops or other sensor are deployed then the entire pallet nailing machine shuts down. System controls are located at the main panel where you can reset the system, engage the motors and commence with the nailing sequence. Our Perimeter Access Control System provides detection at the machine access points such as the pallet jig and access doors. The SensaGuard™ non-contact interlock inductive switches are mounted on all access doors to detect entry and the switches hold up well in our harsh industrial environment. 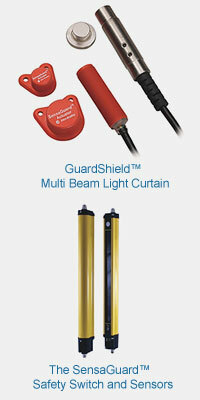 To increase early entry detection our safety light curtain, mounted around the pallet jig loading zone is a photoelectric presences sensor that protects personnel from the machines motion which makes this device a valuable component where protection is needed. Collectively when these safety systems are in place, The Rhino Pallet Nailing Machine™ becomes a joint partner towards your integrated solution on exercising your corporate safety standards. The Rhino Pallet Nailing Machine™ will accommodate many different size pallets ranging in specification. height up to 5-1/2 inches. Please refer to the pallet specifications listed below to determine your pallet parameters. BC Market Solutions™ is a full design and supply chain integrator that is driven to provide cost effective solutions for the material handling industry.